The Electrophorus (eh-lek-trof-er-uhs) is an aquatic creature in ARK: Survival Evolved. Occupying a space in the low-to-middle end of the food chain, Electrophorus beluadomito is a carnivorous swimmer that feeds mostly off of shellfish and small fish. Despite its common name, it is actually a very long Knifefish, and not an Eel. It does not provide much meat, so many predators simply leave it be. Unlike most predators, it does not use brute strength to bring down its prey, but instead releases an electrical charge around itself to knock its prey unconscious. Alone, this can take out a small creature. When attacking together, Electrophorus can even bring down the larger ocean lifeforms, and then feed as a group. ...thus many tribes employ small schools of Electrophorus to shock them into submission! Electrophorus will attack if within view of the creature. Once within its aggro distance, Electrophorus will follow the player, even upon swimming to the surface of the water. It can be found at middle deep-sea and is faster than the Cnidaria. Due to their disabling shock attacks and fast swimming speeds it is best to steer well clear of these creatures without proper preparation. Electrophorus will ignore wild dinos if there is a player or tamed dino in the area. They will chase their prey at very fast speeds and only let go if the prey is very far away, or the prey moves out of the water. If the electrophorus reaches its target, it will zap them. 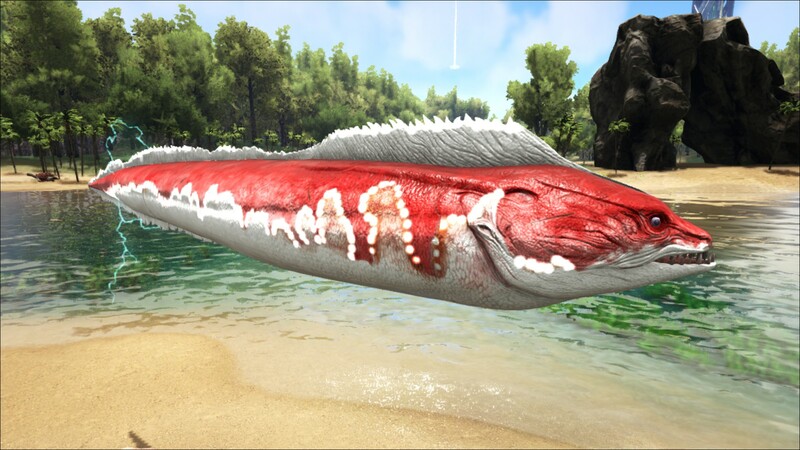 This will slow and reduce the damage output of any creature except for Basilosaurus and Tusoteuthis for 8–10 seconds, rendering them less effective at fighting and possibly ensuring they will not be able to run away. After the prey is zapped, the Electrophorus and any nearby wild dinos such as Megalodons will start to feast on the helpless meal. Electrophorus is a long eel like fish with a fin running from the back of its head to its abdomen. Its mouth is packed with sharp teeth to attack the small fish and shellfish that make up its diet. This section displays the Electrophorus's natural colors and regions. 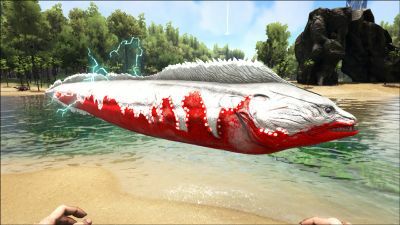 For demonstration, the regions below are colored red over an albino Electrophorus. The colored squares shown underneath each region's description are the colors that the Electrophorus will randomly spawn with to provide an overall range of its natural color scheme. Hover your cursor over a color to display its name and ID. For example, "cheat SetTargetDinoColor 0 6" would color the Electrophorus's "main body" magenta. Passive tame, it is very aggressive with a wide aggro radius. Stay clear if not prepared. Riot Armor / high fortitude for Torpor reduction recommended. High oxygen to chase them down and feed them bait/taming feed. Mount Basilosaurus and allow the Electrophorus to shock your creature, while mounted. The Basilo will not take any damage and its movement will not be impaired. While the Electrophorus is recharging its electrical attack, quickly dismount your Basilo and passively feed your attempted tame. Remount, rinse and repeat. It is possible, but difficult to tame Electrophorus one-on-one without using a trap. Clear out any threats nearby; Have at least bio toxin ready, and lure one out into shallow water. From there, it is a matter of time and caution. Make sure to bring either health tonics or blood packs along with stimulants for a quick recovery between feeding attempts. Electrophorus are found at the very bottom of the South East Trench on The Center. This section describes how to fight against the Electrophorus. Use a Basilosaurus -- it is immune to the movement and damage debuffs, and Eels do very little damage with their regular bite. Their shock does nothing to the Basil, even when multiple Eels chain a huge shock. You, the rider, will be completely unharmed as well, with no torpor gain. Any other mount will need a good amount of health and damage to overcome both the burst damage of their shock and to fight through the damage debuff. Scuba flippers or a fast swimming mount are required. Distance weapons are the best choice (spears, crossbow, Harpoon gun, Tek Rifle). Note that Eels are faster than a player with flippers, but flippers will still provide you extra time to kill the Eels before they contact you. They can chain their electric shock to other eels to unleash even more powerful attacks. One shock is often enough to kill you outright even in flak armor if there are enough grouped up. Tend to be in packs of 2 or more. Often are inside of rocks or behind walls, and can swim through them to surprise you when you least expect it, and not only in the sea caves but even large rocks at the bottom of the ocean. Harder to see at daytime because the glow they have is less obvious. In a pack they have high burst damage as their shock chains together. Make sure your mount has enough health to not be immediately killed. The range of the shock is much larger than any other creature, and they are over 5 times faster than Cnidaria. High damage burst but lower sustained damage. If you can survive the initial shock, you will have an opening to retaliate. Basilosaurus doesn't get shocked, so use that. Low damage individually. Picking a few of them off with ranged weaponry first will greatly weaken the attacks of the remaining Electrophorus. Is extremely easy to spot and identify from a distance. Their shock-ability makes them useful to fight other, larger creatures. Particularly useful on Alphas, and also useful for taming creatures. Despite the general lack of PvP that occurs underwater, the Electrophorus still finds a purpose in weakening players and their tames. Pair a school of these with a school of high-level mantas, and you can easily shred any underwater mount. Having a pack of these to initiate a fight can cause heavy up front damage. This dossier was revealed on 07/27/2015 on Steam. Electrophorus is one of the only creatures in ARK with a genus that still exists today, such as the Coelacanth or Achatina. The real electric eel, as its name implies, is also capable of producing electric discharges to kill prey and deter predators. Unlike in the real world, Electrophorus does not look like a knifefish, an order of fish that Electrophorus belongs to; but like the unrelated moray eels. The Electrophorus is a simple capacitive generator. A first version of it was invented in 1762 by Swedish professor Johan Carl Wilcke. It's name, meaning Electricity Bearer, was coined more than ten years after that by Alessandro Volta. 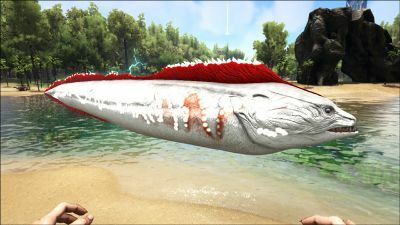 Prior to patch v262.16, eels were much more powerful. In addition to being more common and having a larger aggro radius, their shock would stun their prey for the duration, preventing any action and dismounting riders. As the shock has a shorter recharge than the debuff duration, this meant a single level 1 eel could potentially stunlock and kill a level 300 tamed Mosasaurus given enough time. This rendered almost every mount except the Basilosaurus nonviable for deep sea exploration as a single encounter would often spell doom for any other mount. And due to the Basil's inability to go too deep in the water, many tribes considered the ocean floor to be completely inaccessible. This page was last edited on 31 March 2019, at 22:13.